Each user can manually drag and drop project tasks in any order. This is a very popular GTD method that any user can apply on their projects. The drag and drop functionality is currently available on individual projects. This page outlines how drag and drop works in Projecturf. 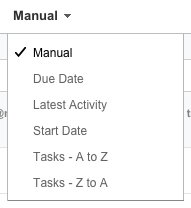 To begin sorting tasks manually, you must be in the tasks section of a project and in the list view. To get started, simply click on a task and move it up or down in the list and drop it in between any tasks you'd like. Continue to rearrange the tasks based on your preference. If you drag a task above or below what's currently displayed on the screen, it will scroll automatically so that you can add the task anywhere. Once you've made your changes to the order, your new sort order will be saved as manual under the sort menu at the top of the screen. To get back to this manual sort view, simply select manual from the sort options. If you have not already sorted the tasks manually, you can start sorting from any sort view and you will see the sort change to manual for you automatically. 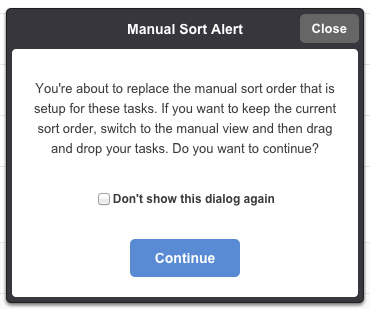 However, if you already have a manual sort order setup and you begin dragging and dropping tasks when you are not in the manual sort view, you will completely replace the existing manual sort view. This cannot be undone. Therefore, always change to the manual view first before you begin dragging or manually moving around tasks if you want to keep your existing sort order. This will save you from losing your manual order if you didn't realize which sort view you were in when you began dragging a task. If you click to continue, then the manual sort view will be automatically replaced with the current view that you are making changes to. You can also choose to dismiss this as a future message by checking the box for "Don't show this dialog again." When the task list is filtered by specific dates, people, flagged, or completed tasks, you cannot sort or manually change the task list. This is the case regardless of the sort you are currently in. To begin sorting, simply remove the filters (i.e. select all dates from the date filter). Users will only be able to move tasks / subtasks around in each of the scenarios below if they have specific user permissions (or if they are a project manager on the project). Essentially if a user has permissions to mark a task complete, then they can move it. To make a subtask a parent task, click on the subtask row and move it to the left in the list and then drop it. Once it's dropped, the subtask will become a parent task. Before changing up your tasks, we recommend you switch it to manual view so you do not replace the manual sort view that's currently saved. To make a parent task a subtask, click on the parent row and move it to another parent task (just below the parent task description - you will see an extra space there to drop it when dragging) in the list and then drop it. If the parent task you are moving it to has several other subtasks, you must drop it beneath the new parent task. Once it's dropped, this parent task will become a subtask of the parent task you dropped it in. Note that if the parent task already has subtasks and the list is currently collapsed when dragging the task into it, you will need to drag it until you get the extra space under the parent task before dropping it. To drag a subtask to a parent task, drag the subtask to the parent task you want to add it to and drop it right underneath the parent task. To change the order of subtasks within a parent task, simply drag the subtasks around within the subtask list and drop them in the order you prefer.